Our Team Building Training focuses on team leadership and team management. Team functioning significantly improves of participants who undergo training through our workshops. 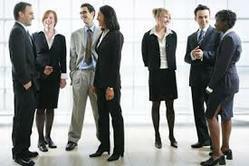 - This activity requires participants to THINK & WORK as a team. - Encourages systems thinking, where participants will come to realise that it is beneficial to see work processes as a whole instead of seeing them as parts. - (Rational Use of Medicine) training for Doctors/ Health Workers/ Pharmacists/ and others. - Medical Store Management (MSM) for pharmacists/ persons dealing in medical stock. - HET (Health Education Training) on different aspects for different targeted population including emergency medical management in disaster. Highly engaging team building games and activities are guaranteed to leave the participants enthralled. This is a completely customisable training solution by Training India, to suit the unique requirements of the respective teams.